No matter what it is that seems to be our need or problem, we can find something to rejoice in, something for which to give thanks. It is not God who needs to be thanked, but we who need to be thankful. Thankfulness opens new doors to good in our life. Thankfulness creates a new heart and a new spirit in us. Inevitably, there are times of stress in our lives, no matter how long we’ve been in recovery. Sometimes, the stress is outside or around us. We’re feeling balanced, but our circumstances are stressful. Sometimes, the stress is within; we feel out of balance. No one likes a martyr. How do we feel around martyrs? Guilty, angry, trapped, negative, and anxious to get away. Somehow, many of us have developed the belief that depriving ourselves, not taking care of ourselves, being a victim, and suffering needlessly will get us what we want. i hope you had a wonderful weekend and a great easter with your family! The winds of change blow through our life, sometimes gently, sometimes like a tropical storm. Yes, we have resting places – time to adjust to another level of living, time to get our balance, time to enjoy the rewards. We have time to catch our breath. Your ability to reason and judge something as harmful and dangerous is hyjacked by slots ie. their intentional purpose and design. Addiction by design! Stay away. I went crazy three weeks ago and got addicted to a casino slot machine. I’ve always bought lottery tickets but the casino made me do questionable things to get money to gamble. 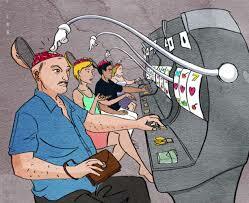 Gambling addiction has got to be the worst addiction in existence. I’ve been a gambler for 10 years now and I am in desperation to stop but can not hit the off button unfortunately. It would be nice. I am probably 30 000 $ in debt this year because of gambling and I continue to keep going because it’s ” fun “. I can stand what I know. It’s what I don’t know that frightens me. In the face of an obstacle, which is impossible to overcome, stubbornness is stupid. I’m a compulsive gambler. My life, including my finances, become unmanageable when I gamble. Taking one day at a time to not start the cycle of insanity all over again by placing that first bet today. Just for today: I choose not to gamble. Did you ever do questionable things for money to gamble. Not stealing but other things?